The TVS Apache RR310 has been pretty quick in establishing itself in the Indian performance motorcycle segment. Thanks to its mini-me Ducati looks, sorted dynamics, and a grunty powerplant, the TVS flagship finds almost a thousand takers every month. Recently, rumours regarding high spare parts prices surfaced on the web world. 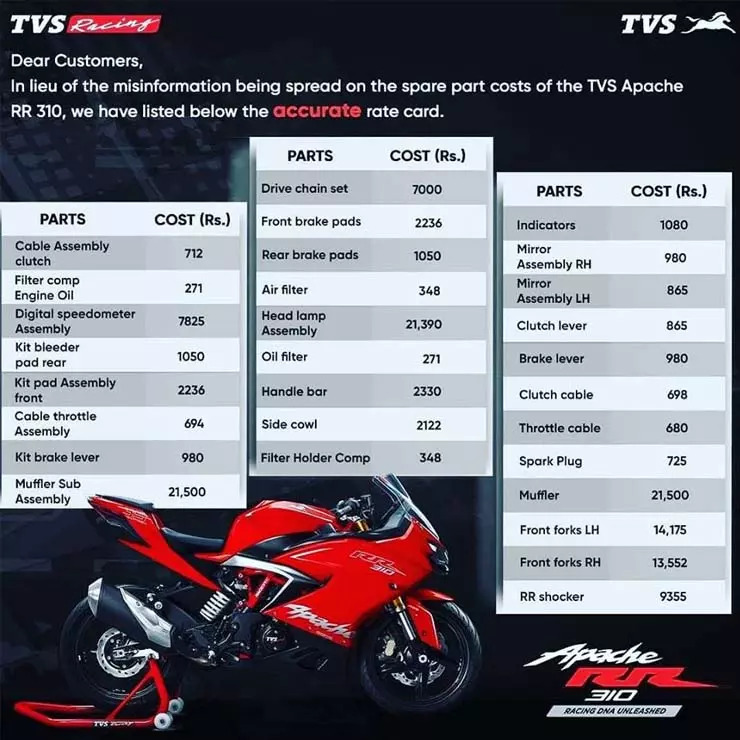 However, TVS has been quick to dismiss the badly researched reports and has released the official price list of the spare parts to clear the air about the costs of the most commonly replaced parts. The above price list gives prices of most of the common parts that suffer damage in the event of a crash. The brake lever kit, for example, costs Rs 980 while the clutch cable assembly, on the other hand, costs Rs 712. It may be noted here that it’s not uncommon for the brake lever to suffer damage in a minor fall. Even the clutch cable of a motorcycle is prone to snapping. The throttle cable costs Rs 680. Talking about the major parts, the handlebar costs Rs 2,330, which is another part of a motorcycle that is prone to damage in the event of a crash. The indicators, which are often the first parts to come in contact with the ground in the event of a crash, cost Rs 1,080 apiece. The air filter and the oil filter, which are among the parts that are required to be changed frequently, cost only Rs 348 and Rs 271, respectively. Other such parts in the above list include the front and rear brake pads, which cost Rs 2,236 and Rs 1,050, respectively. The two most expensive parts in the above list are the muffler subassembly and the headlamp assembly, both of which cost more than Rs 21,000. The front forks cost Rs 14,175 and Rs 13,552 for the left-hand side and right-hand side units, respectively. The TVS Apache RR310 was launched in India in December last year. Its South India-based manufacturer sells around 1,000 units of this motorcycle every month. The TVS flagship was launched at an introductory ex-showroom price of Rs 2.05 lakh, but now casts Rs 2.13 lakh (ex-showroom, Mumbai).